Have you seen the Unisit rider "seat belt"? One look and you know what it's for. While it is a delightfully insulting gift idea for the frenemy, the "buzz" on the listservs is that this is a useful tool for teaching how the correct sitting trot feels. At $179, it doesn't strike me as the kind of thing an individual would buy -- a riding instructor or trainer might use it on different students to give them a feel for sitting the trot. That was my first thought, but instructors who have used the device assure me that there is a quick-release feature in the event the rider falls, because when all is said and done we never wish ill of our frenemies. Ideally, I'd prefer to have someone knowledgable show me how this thing works and how to adjust it safely. The product comes with a video that presumably helps with this. If you're gonna strap yourself to a 1200 lb horse, you'd better know you're doing it right. Hmmm...don't know how this one works, but I agree that it looks dangerous. As a therapeutic riding instructor, I teach students with a variety of balance challenges. I can offer a western saddle, extra handles, or side-walkers, but one thing that I am not permitted to do is strap them to the horse. This would violate NARHA safety standards. This device looks like it will cause the rider to arch the lower back. This nasty habit was taught to me and it has taken years of careful practice to reverse. I would never use a device that encouraged the rider to roll onto the pubic bone. Still, there's not a gadget that won't attract some following out there online, is there? Doesn't look safe to me, either. "Quick release" --never to be trusted. Internet friend had one of those inflatable safety vests that was supposed to inflate if she fell from the horse--had a strap that was supposed to pull the inflating device as soon as she parted company from the saddle. She fell, and the thing failed to inflate. So, same difference here as far as I'm concerned. And I agree that it looks like it might encourage an arched back. I've found you can approximate the same feeling by simply holding the pommel of the saddle with one hand and thinking, "Hips towards your hand." A lot safer, I think. I second the pommel grab. I had an instructor who made me work on the sitting trot without stirrups and that did the trick. I think that I'd rather just plug away at trying to improve my sitting trot than strapping myself to my horse. In my mind tying self to horse=bad idea along with spending 179$ on something like that when I still don't own a saddle. Santa? I totally have to agree with Val. It does seem like it'd cause you to hollow your back. 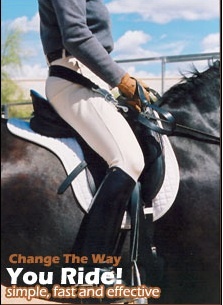 An evil habit to break, but so many hunter riders ride with their buts out, and many coaches teach it! Drives me insane, as that totally changes how you sit, closing the angle of your hip and causing the rider to squeeze with their knees. I do think it'd be fun to try out this comtraption, merely to see what it feels like, and if it actually works. I'd want to be on a really safe horse though. Best way to learn sitting trot is on a lunge line, with no stirrups and no reins, on a well-trained horse that reliably lifts his back. If any trainer pulled that device out and wanted me to use it I'd run hard in the opposite direction! And I agree, longe lessons, sit-ups, for the win!!! I have ridden in that thing. When I was done I had the most horrific cramp in my hip. It sure does make you sit well though and my horse went much better. Your horse has to be strong enough in the back go handle all sitting trot though. Hi. I am actually looking for one of these. Does anyone have one that they would like to get rid of?